Nestled in a scenic valley carved by the Lehigh River, the town of just over 5,000 people is the gateway to the Pocono Mountains. 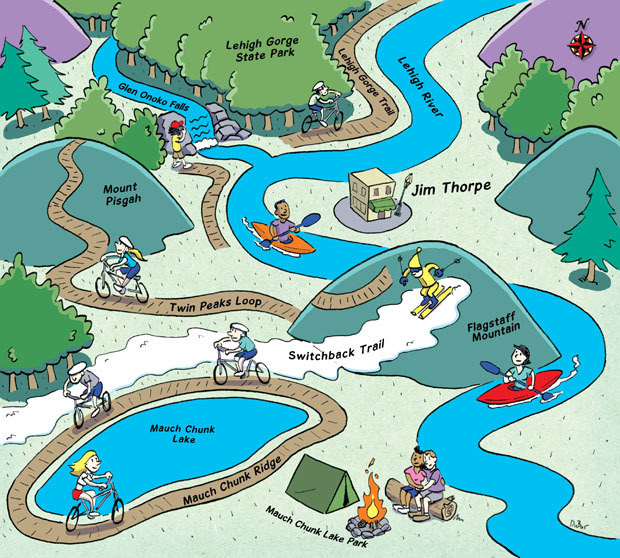 With trails that run right through town, Jim Thorpe is a popular outdoor escape for city dwellers, located just an hour and a half from Philadelphia and two from New York City. Once branded the “Switzerland of America,” Jim Thorpe features Victorian buildings, colorful shops and restaurants, and a lively music scene at venues like Penn’s Peak and the Mauch Chunk Opera House. But most folks come for the outdoor opportunities. Best Mountain Bike Ride For a singletrack fix, try the 20-mile Twin Peaks loop or Mauch Chunk Ridge for a 10-mile rocky rollercoaster. Each offers a screeching downhill stint off of the Flagstaff Mountain ridge. Best Family Bike Ride The Lehigh Gorge Trail in Lehigh Gorge State Park is great for families that want to slowly pedal along the river. The 25-mile rail trail runs from White Haven to Jim Thorpe. Best Cross-Country Ski Trails People in the Poconos love to cross-country ski, and you can do it right from town on the Switchback Trail. Start at Flagstaff Road and ski up to Mauch Chunk Lake. When the ice is thick enough, ski out onto the lake and take in the 360-degree view. 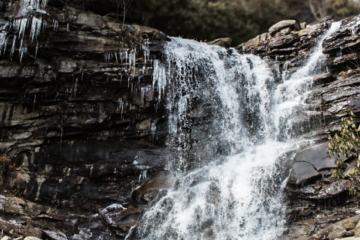 Best Day Hike Get a taste of the area’s steep gorge hiking with a hearty climb on the Glen Onoko Falls Trail. Reward comes when you reach the majestic 900-foot cascade on Broad Mountain. Best Camping Spot Mauch Chunk Lake Park has a beautiful, tree-canopied campground in the valley below Flagstaff Mountain. 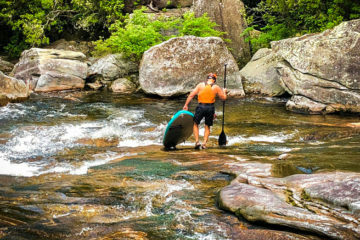 Best Paddle Spots If you’re looking for whitewater, drop your boat in the upper part of the Lehigh for a bouncy class III run. The slower section from Jim Thorpe to Bowmanstown is a great trip for beginners with class I-II rapids. Jim Thorpe is named after the Olympic decathlete who won two gold medals in 1912 and also played professional football, baseball, and basketball.